When it comes to tech companies, valuation is often in the eye of the beholder, as Twitter and Snapchat's current values illustrate. How can social-media upstart Snapchat, with scant revenues and ongoing net losses, be worth more than twice microblogging platform Twitter (NYSE:TWTR)? The vanishing-video and photo app is reportedly wrapping up a new round of financing that pegs Snapchat at a cool $20 billion, compared with the $9.8 billion market capitalization Twitter currently sports. Let's quickly examine what led to this social-media changing of the guard. According to a number of media outlets, Snapchat is quickly finishing a fresh round of financing that pegs the four-year-old company at a valuation of $20 billion. This fundraising round is technically a follow-on to Snapchat's February Series-F financing, which pegged the company at a $16 billion valuation. However, an analysis from private-funding analyst group VC Experts notes that financing could expand Snapchat's valuation to over $20 billion, should all the shares authorized as part of the fundraising actually become issued. TechCrunch and other outlets are reporting that this follow-on offering indeed pushes Snapchat's valuation to $20 billion. If so, this new valuation makes Snapchat the fifth most valuable privately held unicorn -- a start-up valued in excess of $1 billion -- behind other well-known names such as Uber, Xiaomi, AirBnb, and Chinese ride-hailing app Didi Chuxing. So now that we understand the specifics of Snapchat's $20 billion valuation, let's see why it sits at more than double that of Twitter. Why is Snapchat worth more than Twitter? The disparity in valuations between Snapchat and Twitter speak as much to Snapchat's seeming overnight success as to Twitter's post-IPO struggles. Twitter's stock has been decimated over the past year, thanks to issues ranging from slowing growth to management hirings and firings. 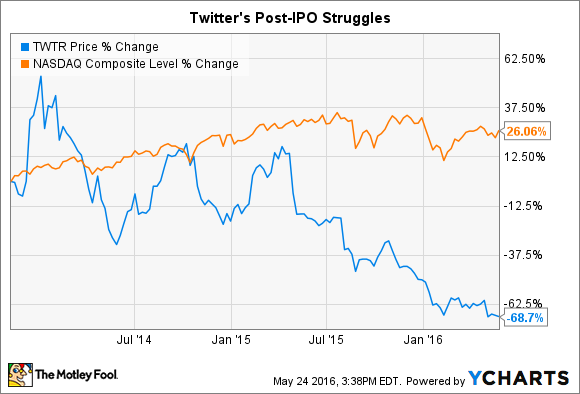 Internal issues at Twitter aside, what about the fundamentals underpinning these valuations? What supports them? Much of the valuation attached to tech companies whose business models are still evolving is based on growth. Tech investors and venture capitalists love companies that are expanding rapidly. And when it comes to growth, Snapchat trounces Twitter, even though Twitter's revenues easily exceed Snapchat's and Twitter is expected to reach consistent profitability this year. The average analyst estimate calls for Twitter's sales to grow 23% and 21% in the next two years, with revenues totaling $2.7 billion and $3.3 billion . Few companies are ever fortunate enough to surpass $1 billion in sales, so Twitter's accomplishments shouldn't be ignored as much as they seem to be. However, with Twitter's user growth having flatlined in recent quarters, its valuation will probably remain constrained as long as investors see no path for it to address an appreciably larger market, profits notwithstanding. Case in point, Twitter's valuation today sits below its pre-IPO value, which was also based on the idea that Twitter could reach a far larger audience than it has today. This need to expand its addressable market, incidentally, is also why I so strongly advocate that newly reappointed CEO Jack Dorsey needs to innovate more aggressively on the product front. Conversely, though it lags Twitter's financial size today, Snapchat is growing like a weed, giving investors hope that it will become the next Facebook, the next hundred-billion-dollar platform. According to reports, the vanishing-video app has seen its engagement stats explode from a reported 7 billion daily video views at the start of the year to in excess of 10 billion at the end of last month. As it turns an increasing eye toward monetization, Snapchat is reportedly targeting between $300 million and $350 million in sales this year, up nearly sixfold from last year. The company appears to yet have settled on a core monetization strategy, like search ads for Alphabet for example. Instead, Snapchat's monetization efforts today rely on a mix of syndicated short media content from its Discover page, sponsored face covering "stickers" or geofilters (as absurd as that sounds), sponsored collections of location or event-specific images called "stories," and the like. With monetization taking a greater emphasis, Snapchat's long-term revenue model should take clearer shape over the next few years. Investors, it seems, are betting that Snapchat will indeed become the next major force in online media, whereas Twitter's prospects of securing a similarly vaunted position are far less certain thanks to its recent slowdown. While this line of thinking isn't necessarily based on the same fundamental analysis value investors use to shape their investment decisions, it helps explain why Snapchat is worth more than Twitter.